Stand and Deliver recently conducted an excellent interview with Dr. Stuart Fischbein, a Southern California VBAC and breech supportive OB. It’s an excellent read and I’m including my favorite parts below. You can read the entire article here: Stand and Deliver: Interview with Dr. Stuart J. Fischbein. Don’t hospitals ban VBAC because it is dangerous? They ban VBACs under the guise of patient safety. But patient safety is a euphemism for “we don’t have a good evidence-based reason to do it, other than we don’t want to get sued, it’s more expedient, and we make more money from c-sections—the hospital does, not necessarily the physician, but the hospital does—so we’re going to ban it because it’s easier for us, and we’re going to say it’s for patient safety because of the risk of rupturing the uterus.” But you know what? That risk should be something that the patient decides. Patients have a right to be given informed consent, free from misinformation or coercion, free from skewing information that benefits the practitioner or the hospital. And they have the right to consent or refuse to accept the treatment that’s offered. That right is frequently being denied. What role does malpractice insurance play in VBAC availability? The reason that a lot of hospitals ban VBACs anyway [despite meeting ACOG’s “immediately available” recommendation] —and this isn’t very well known to most people—is because their insurance carrier will tell them that if they allow VBACs, their premium will be much higher. Rather than pay higher premiums, they just ban VBACs and do so under the guise of patient safety. The hospital lawyers, the insurance company lawyers, the insurance company executives, and the hospital administrators are making decisions for patients and then lying about why they’re doing it. Aren’t uterine ruptures the primary reason for repeat cesareans in women with a prior cesarean? Most emergency c-sections, the ones that occur suddenly, have nothing to do with a uterine rupture. They are for placental abruption, prolapsed cord, or prolonged fetal heart rate decelerations. Far more often, it’s something unrelated to the VBAC that causes an emergency. And somehow the hospital can manage to take care of those situations. If hospitals can take care of those things, why can they not take care of VBACs? ACOG’s latest VBAC recommendation was based on consensus opinion, not scientific evidence. Doesn’t that matter to hospitals when implementing VBAC bans? Ultimately it won’t matter to the hospital. It’s not about evidence-based medicine. It’s very clear to me in discussing this with the committees that they don’t care. They’re being told by the risk managers, the lawyers, and the insurance companies that they cannot do VBACs. And that’s the final word. The anesthesia departments are also often behind VBAC bans. They talk about patient safety, but really it is that reimbursement is so bad and they don’t want to have to sit around in the hospital all day long and they are fearful of being sued. Do hospital administrators impact how an OB counsels a woman on VBAC? I’m supposed to tell patients that they have to go elsewhere if they want a VBAC, that they can’t stay in their own community, that they have to drive 50 miles. … I’m not supposed to tell them that they have the option of showing up in labor and refusing surgery. The hospital actually put in writing that I should avoid telling them that. They’re telling me to skew my counseling, and they have no shame in doing so. How do OBs feel about working in hospitals with VBAC/breech bans? For physicians who are not really committed to doing VBACs or breeches, it’s a lot easier to do a section. You get paid about the same. With a section, you can do the surgery at 7:30 am and you’re in the office by 9 am. If you have a breech or a VBAC, you have to cancel your day or spend the night at the hospital. It’s a lot more work, and you don’t get paid any more for it. So you really have to be either dedicated or crazy or somewhere in between. You have to keep your ethical feet well-grounded. How do VBAC bans impact hospital revenues? For hospitals, it’s easy. Does a hospital make more money off a practice that has a 5% c-section rate or a 25% c-section rate? That’s an easy question. Although they will never admit that; [the official reason for VBAC bans] will always be patient safety. Clearly, there’s no incentive for them to offer a VBAC to anybody. How do VBAC bans impact women seeking VBAC? A successful VBAC occurs about 73% of the time. If a hospital bans VBAC, they’re basically telling 73% of women that they have to undergo a surgical procedure that carries more morbidity than if they had a vaginal birth. How could tort reform impact VBAC supportive OBs and birthing women? [With] tort reform, you might be able to make changes by improving competition. If you get rid of some of the restrictions on businesses, you might see more competition start up. You might see more birth centers open, or birth centers that actually have operating rooms, little maternity hospitals. Just like we’ve seen specialty surgery centers open up recently. For years hospitals tried to squelch these things because they know they can’t compete with them. Some day, maybe the major hospital model will go out of business. And would that be so terrible? We have specialty hospitals that do heart surgeries, gastric bypass, or plastic surgery. Why not specialty hospitals that just do maternity? Run by doctors and midwives. I asked my OB about Vba2c and was told quote “Absolutely not! No. No way. Thats is not (get this) ‘ALLOWED’ at [our hospital] or in [our city]!” So i dont get to decide whether or not my abdomen and sexual organ or mutilated? I was later told by a mid wife that I could just show up at the L&D in late stages of labor and refuse, but that aside from hba2c, that would probably be my only option. Through my own research I have learned that it is not illegal to vbac in any state and from my understanding a woman who show up at a hospital in active labor can not be turned away nor can she be refused treatment due to uterine scars. A woman also can not be forced to have a cesarean, though there have been cases of court-ordered cesareans when refused and there are few documented occurances of this. It is our body, our child, and our right to choose. The way I see it is…if I had a DNR order in place and flat lined on the table no one (medical practitioner) would question, argue, or deny that right. I have the right to choose death then I have the right to decide how my children are born. Period. So am I correct in my understanding from this article that it is possible to have a vbac in a hospital that has the De Facto ban? My son had his neck bent so did not come out they did not try to reposition him but rather preformed a c section. I feel completely cheated hewas a month premature and weighed less than my other two children who were delivered vaginaly. Now all the Dr.s in that town say that I will have to travel 6 hours away to have a vbac. I plan to try to get pregnant and giving birth about 18months apart. And am seriously tempted to continue using my normal ob dr. and hospital but refusing a repeat section. Any sujestions? Have you talked to all your OBs in town and within a reasonable distance to your town? How about Family Practice doctor? As finding a VBAC supportive care provider is the #1 thing you can do to have a successful VBAC, make sure that you exhaust all local options before considering traveling 6 hours. (I’m sorry to be so literal with the obvious! 🙂 ) Get a copy of your medical records & operative report from your first CS, get the names of VBAC supportive providers, and ask the right questions. Read more about planning a VBAC. Hi Karla, Your Dr sounds like my previous one. I had to drop him because he was so obviously skewed when he declared me a repeat c-section candidate. He said that the exact reason for which I had my first c-section (fetal distress) would happen with my current pregnancy. He was so focused on his advocacy for repeat c-section that he neglected to talk about the risks and benefits of both rcs and VBAC. He said “no vbac, and no doulas”, no matter what. I asked for my file, and found some unpleasant additions to my information. My new Dr has a “lets see what your body can do” approach. You need to find a different doctor or midwife! Good luck!! Don’t listen to him unless he has a *Good* reason. Sounds like he doesn’t. I had a similar experience with my VBAC doctors. Today I had a dr. appt. where I was called “Selfish” and told by the dr. that he was “appalled that I would risk the life of my baby” to have a VBAC (in the past, I’ve had a section, a VBAC, and a section). He tells me that if he is on call when I come into the hospital in labor he will see me, but if he is not on call, he will NOT get up at 3 in the morning to deliver this baby. His excuse for counseling me to have a section is uterine rupture. When I quote a 1-7% rupture rate, he says it is 10%. Today I refused a second time to have a section, much to his appallment, and discovered that he has put in my file that my baby is breech when that is not true at all. Last week’s ultrasound indicated that the baby was head down, and seeing how he did no abdominal exam or ultrasound at today’s appt., there is no way he can say this baby is breech except to have it in my file as the “reasoning” behind why he is counseling me to a section. 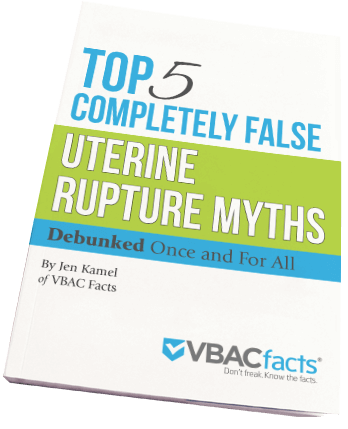 As a nationally recognized consumer advocate and Founder of VBAC Facts®, Jen Kamel helps birth professionals, and cesarean parents, achieve clarity on vaginal birth after cesarean (VBAC) through her educational courses, training programs, and consulting services. She speaks at conferences across the country, presents Grand Rounds at hospitals, advises advocates seeking legislative change in their state, and serves as a expert witness in legal proceedings. She envisions a time when every pregnant person seeking VBAC has access to unbiased information, respectful providers, and community support, so they can plan the birth of their choosing in the setting they desire.